I didn’t even know that the Michel Gondry directed Green Hornet had already made it to theatres, let alone playing in rep cinemas. So I was happy for the opportunity to see the film on the cheap. I’m generally fond of Michel Gondry films, and Seth Rogen films, I was curious how the two would mix. I was pleasantly surprised. 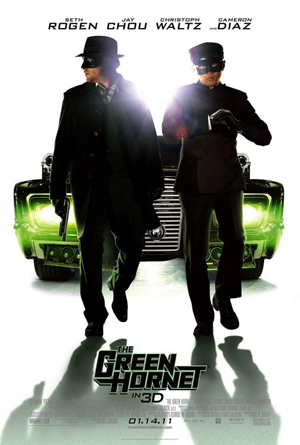 Gondry’s style works great for a superhero film, and the relationship between The Green Hornet and Kato was well constructed and fun to watch. Jay Chou and Seth Rogen were great in their roles, and even better were Christoph Waltz as the German baddy, and Edward James Olmos as the newspaper editor. I don’t think this is a film that I’ll be going back to and watching often, but it was a fun romp.